Documentary about Cole Forge Stoves - "How Do We Human?" There’s an incredible filmmaker here in Vermont who recently started a new web series (that’s basically a collection of short documentaries) and she decided to feature Cole Forge Stoves! "My web series, “How Do We Human?”, will be about the chaotic moment we're at in human history where many of us, or at least some of us, are choosing not to put blinders on but instead investigate how to adapt so that, to put it bluntly, our species won't destroy the life-sustaining climate of our planet and ourselves in the process. I will be following the activities of people who have varying ways of answering the question of what's the best way to be a human, all expressed through their craft, their mission, their heart, or their relationship with the land." My friend Andy LoDolce put together an incredible soundtrack to match, and the finished product gets me all fired up! Have a watch and if you enjoy it, check out Elizabeth’s Patreon page. I love to cook. And I really really love to cook when I’m using my Cole Forge Stove. I’ve never been big on baking, but that changed when I started making sourdough bread. With a little experimentation, I realized that I could spend 15 minutes in the kitchen and end up with a loaf that was magnitudes better than anything I could find at my local grocery store. To understand why homemade sourdough is so much better than store-bought sliced bread, allow me to give you a little bread history lesson. People have been making bread for thousands of years and it is only in the last 100 years that we started messing it up. All of a sudden, we abandoned the time-tested recipes of our ancestors and instead we began using bleached white flour, devoid of the important nutrients that make bread so nutritious. The addition of stabilizers and preservatives allowed this “bread” to sit on shelves for weeks without molding. And engineered quick-rise yeasts allowed large factories to spit out thousands of loaves an hour. At the time, all of these changes seemed like advancements, but in retrospect, our bread lost both its nutrition and its soul. On top of that, agricultural “advancements” began happening as well. Huge swaths of forest and grasslands (and small, diversified family farms) were cleared and planted as corn, soybean, and wheat monocultures, with only one species for hundreds of square miles. Large corporations created fossil-fuel-based fertilizers and they were sprayed across the landscape. “Productivity” increased. Nature abhors a monoculture and soon insect, critter, and “pest” populations boomed in response to this abundance and these same large corporations devised new pesticides and chemicals to beat nature back into submission. Perhaps you’re familiar with one of the most common chemicals that ends up on our wheat: glyphosate, which goes by the brand name Roundup. Glyphosate is a brutally effective pesticide and it’s also used to desiccate wheat a few days before harvest, which means that a lot of it ends up in our food. There are plenty of great resources on the internet that go into great detail on the harmful effects of glyphosate, but it is really nasty stuff. I personally think it’s the root of a lot of chronic illnesses humans are currently suffering from and I’m quite confident that most people that have recently discovered they are gluten-intolerant are actually glyphosate-intolerant. Thus, I’ve learned a lot from my study of sourdough bread - both about baking and also about agriculture. It’s really satisfying to create a crusty, chewy, steamy loaf of sourdough with your own two hands and such a simple collection of ingredients. All you need is flour, water, and salt. There’s no kneading, no special ingredients, no dough-shaping shenanigans. It’s an honest recipe with an exceptionally delicious result. Sometimes the old way of doing things is just better. It’s better for your health, it has better flavor, and most importantly, it will make you happier! Unlike commercially produced bread, sourdough uses natural yeasts and enzymes and a long fermentation process to slowly leaven the bread over the course of half a day or more. This breaks down the complex carbohydrates in flour and makes more of the nutrients in the wheat accessible to us. I like to think of these natural yeasts as doing part of the digestion process for us so our stomachs don’t have to do quite so much work. Using organic flour means that you won’t be eating poison with each bite and you certainly won’t be adding any preservatives because your family will devour it before it even has a chance to cool. I guess I forgot to mention that this stuff is absolutely, ridiculously delicious! It makes me wonder how we ever started eating the cardboard stuff from the store back when it was first introduced. Talk about a huge sacrifice! I guess the corn syrup and salt they put in there is enough to trick us into buying it. One of the cool things about sourdough is that the starter will slowly adapt to whatever natural yeasts exist in your environment. That’s why sourdough bread from San Francisco tastes different from Vermont sourdough. It’s a real, live culture and the complexities in flavor that arise from that are fascinating and delicious. It’s true that eating a sourdough-butter sandwich will make your stomach happy, but that’s not what I’m talking about here. 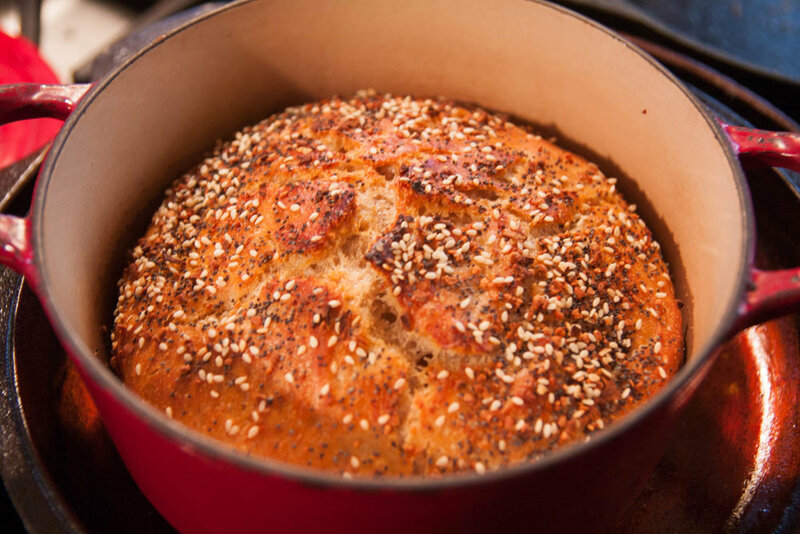 When you take the time to bake a loaf of bread for the people you love, they will notice. They won’t scarf it down in front of the TV and they certainly won’t let any go to waste. They’ll thank you! And they’ll value it for what it is: nourishment and love, not just a few bucks spent at the local Walmart Supercenter. That, in turn, will bring you happiness and the wheel will continue to turn when you share the recipe and a little bit of your starter. We have come to expect instant gratification in our modern lives, but sometimes taking the time to do something right is a more fulfilling course of action. To some degree, I see sourdough baking as a great analogue for my wood stoves. We used to have ‘heating our homes’ and ‘cooking our food’ fairly well figured out, but “advances” have ruined our environment and our health. There’s a better way right in front of our faces and it’s easy to make the switch. Similarly, my sourdough bread recipe mirrors the design of my stoves. It’s simple, it’s an improvement on a concept that’s been around for a long time, and it puts a smile on your face the second you see it. I love what sourdough bread represents and I want all of my customers to have the satisfaction of smelling fresh baked bread early in the morning as they pull a loaf out of their wood-fired oven. Click here to give it a shot! Check out my 15 Minute Sourdough Recipe! I started Cole Forge Stoves to give people the tools they need to reduce their environmental impact. My stoves allow folks to replace the three appliances that typically consume the most fossil fuels in modern homes. I want all of my employees to be very proud of that. I want them to come to work in the morning knowing that they’re making a difference in the world. I want them to leave at the end of the day with a smile on their face and a contented heart. I want to bring meaning to people’s lives and inspire them in their daily role. I want to hire strong, smart folks that truly share my values. I want to hire people that really and truly hate our society’s dependence on fossil fuels. I also want to really connect with my customers. I want to share my passion and knowledge with them. The more Cole Forge Stoves can educate the masses, the better. I want to be the type of workplace that nurtures people and helps them grow and improve themselves. I want to create an atmosphere that encourages folks to be self sufficient and assume leadership roles. In any job, there needs to be time for executing and also time for growth and learning. It is my goal to provide an environment where people can maximize that learning time. I want employees to spend their entire careers at Cole Forge Stoves, but if they do decide to leave, I want them to leave with more skills and knowledge than they arrived with. While our mission is very serious, I want Cole Forge Stoves to be a fun, exciting place to work. At 40 hrs/week, and with vacations and sleep accounted for, you’ll end up spending 35-40% of your waking hours at work. Thus, it’s important that you enjoy your time at work. It’s also important to me to respect that folks have rich and busy lives outside of work. I want the Cole Forge Stoves factory to look like a ghost-town on snow days. I want to sit around a big table and share a meal with my coworkers each day. I don’t ever want my employees to miss their daughter’s soccer games for work. I expect Cole Forge Stoves to grow quite quickly. I think the idea of a triple-function stove will resonate with folks and I hope that people are eager to do business with me. I plan to charge an honest price for an honest product and I want my stoves to be accessible to everyone. A company needs to make money to stay in business, but I don’t want Cole Forge Stoves to be about growth for growth’s sake. I’ve seen a lot of companies lose sight of their mission in the interest of quarterly dividends and I don’t want Cole Forge Stoves to fall into that trap. In the long run, I want Cole Forge Stoves to be owned by its employees - I can think of no better stewards than the people that are driving it forward. Please reach out if you think you’d like to work at Cole Forge Stoves some day. I’ve been around product design for my whole professional life and I’ve had a lot of great mentors. I’ve also owned some examples of really bad design. I’ve boiled my product design philosophy down into five key themes that I use to guide the design process. The big environmental win of my stoves is the fact that they’re displacing fossil fuel burners in people’s homes, but I try to focus on environmental friendliness in their design as well. Embodied Energy - How much energy did it take to pull this material from the earth and get it to my workshop? Toxicity - Could this material potentially be harmful to folks that are making it, using it, or recycling it? Durability - Long-lasting products do less harm. More on this later. Low Emissions - Ensure that fuels are burned completely and minimal particulate is emitted. Recyclability - Select materials that are easy to reuse or recycle. I don’t want my stoves to be mysterious, shiny boxes, full of marketing gimmicks and “revolutionary new technologies” that haven’t stood the test of time. I want them to be intuitive to use and transparent in how they’re built. I want folks to be able to walk up to one of my stoves and understand everything they need to know about running it in five minutes. Their aesthetic won’t be flashy with stainless steel accents and 35 different colors of enamel coating. They won’t follow the latest trends in home fashion design. They will look just as “at home” in a 1800s farmhouse as they do in a brand-new house and that look won’t wear out in the next fifty years. Unfortunately, we live in a world of disposable products. There are lots of stoves that are built with thin sheet metal that has been stamped out and hurriedly tacked together to meet a bottom line. They do their best to hide shortcuts in the manufacturing process and their stoves need to be replaced in a few years. The quicker their stoves fail, the more stoves they can sell. When you buy one of my stoves, you should be thinking about handing it down to your children or grandchildren so that they can heat their home and cook their food with it. They are designed to last for decades, not just a few years. In the event that something does break, my products are simple and intuitive enough that any handy person can fix them with materials from their local hardware store. There’s a principle of permaculture that I’m really fond of: each element of a system should serve as many functions as possible. I make design decisions to ensure that my stoves are as flexible and versatile as possible. 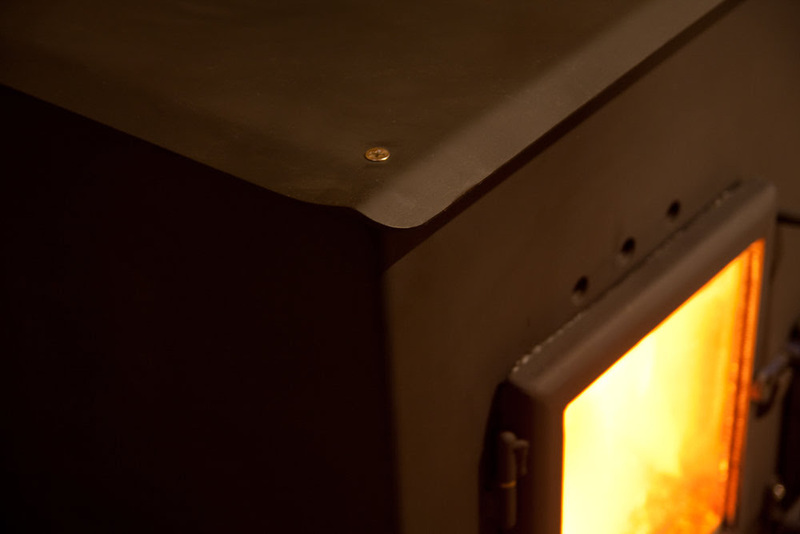 A typical wood stove might only be good at heating your home. A typical range might only be good at sautéing food. My designs can be used for everything from drying your clothes to heating your water and baking your bread. My products aren’t on the bleeding edge of technological innovation, but they do tackle age-old problems in an innovative and clever new way. They also serve roles that you might not typically expect from a wood burning appliance. As my product line grows and expands, I’ll integrate appropriate new technologies to support my other four design principles. I’ve put a lot of blood and sweat (though luckily no tears) into my first prototype and I’m excited to share it with all of you! I learned a lot along the way and I’m confident that my next stove will be more refined and also much easier to build. The majority of the stove is built of thick plate steel, and though I didn’t have much space to work in, I put a lot of time and energy into the details and I’m pleased with how it came out. I’m in the process of conducting a wide variety of tests on the stove and, thus far, I’m really happy with how it is performing. The stove burns nice & hot, and it stores heat quite well. I’ve also been cooking a lot of tasty meals, so follow me on Instagram if you want to see the endless procession of fresh baked bread and gooey grilled cheese coming out of this culinary powerhouse. I’m going to conduct another week or two of testing and then I’ll begin producing stoves for this winter’s testers. I’m hoping to have beta testing stoves produced and installed before Thanksgiving.